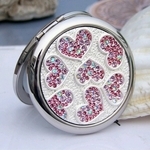 Here's a Jewellery Silver Round compact mirror with designs inspired by fashion & hearts motifs, studded with small crystals and highlighted with whole heart shaped crystals. You deserve the most exclusive and chic makeup mirror. 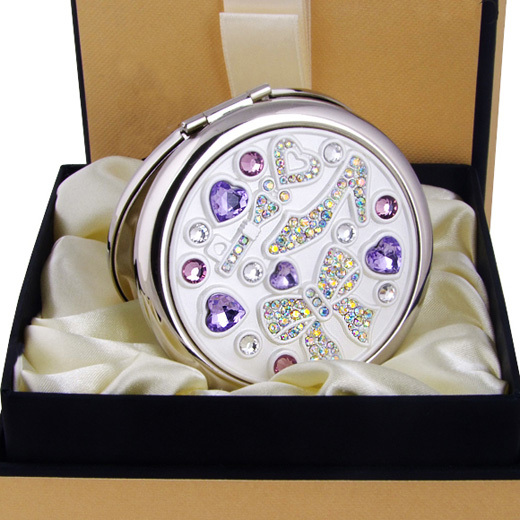 This beautiful compact mirror comes with 2 Japanese anti-fogging mirror, one with a magnified view and the other a normal mirror view for all you make up needs. 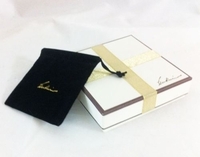 Depending on the design, our jewellery cosmetic mirrors uses pure copper and stainless steel production process, with select outer 24K gold-plated. Each piece is hand-inlaid with quality Swarovski crystal creating our many unique designs.